MHI's Robust Radiators™ are versatile, high temperature heating components that are capable of reaching temperatures of up to 1700°C. 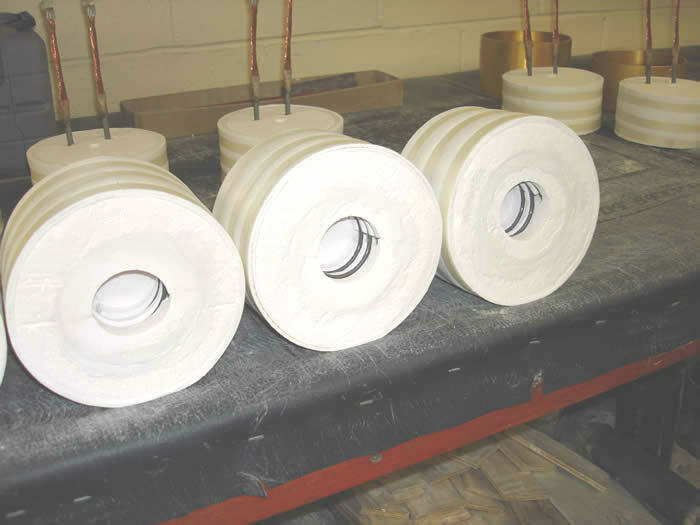 Unlike a high temperature furnace, Robust Radiators™ are more commonly used as components of a larger system. 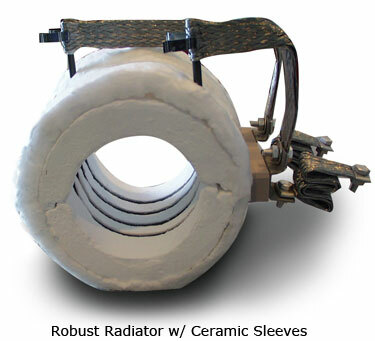 Robust Radiator™ uses include zone heating, crucible heating, pipe heating or other applications requiring high temperatures and high versatility. 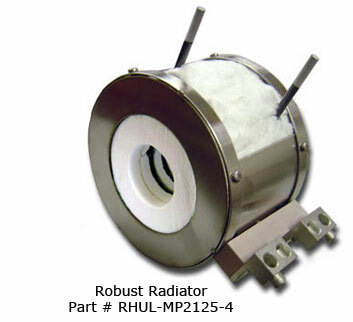 Robust Radiators™ are available with optional end caps to achieve higher chamber temperatures above 1400°C. Robust Radiators™ may be used in vertical or horizontal orientations, allowing for a diverse array of applications. An optional stainless steel shell adds highly accessible terminal connectors to the already robust design. Industrial Size Robust Radiators MRCL-GA6125-24 (6-8" diameter) or Custom Stackable (36 inch diameter) with thee phase TRIPAN controls or Single phase by Zone. MHI Patented MP1900 and MagnaCoil Heating Elements (Made in U.S.A.). Very large RR chambers loose heat rapidly unless well insulated. Chamber temperatures lower when RR diameter exceeds 3" for both types of RR's. Choose from Large Industrial 6" ID (MRCL-GA6125-24) to Smaller 1" ID (RHUL-MP1125-4). MHI offers electrical comprehensive control panels that may be used for power and temperature controls. MRCL Models Limited to 1400°C and lower. RHUL models use UltraCoil™. MRCL models use MagnaCoil™. All Robust Radiators Modules are fitted with the best MHI speciality FiberFree™ ceramics and other insulation. Robust Radiators are often used in a horizontal or vertical stacks as shown on the right. A universal stand for RR's with levelling scres is shown. Easy to connect. Please contact MHI for best electronic control system. For optimal performance, we recommend using a BPAN-O-PLUS Control Panel with Robust Radiators™. MHI's Inline Robust Radiators™ are versatile, high temperature heating devices that are capable of reaching temperatures of up to 1700°C. They can be used in a variety of environments and positions. 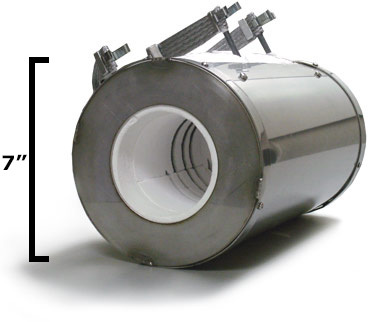 The MHI Inline Robust Radiator™ is available with optional end caps to achieve maximum chamber temperatures and an optional stainless steel shell that adds to the connection accessibility. You can order by part number or inquire about special needs. MHI will be happy to provide a personalized recommendation that will fit your needs. 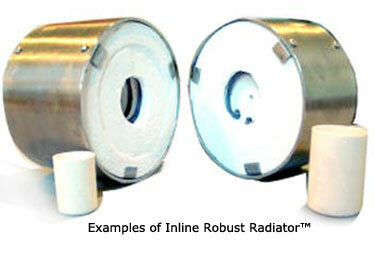 Inline modules come with standard ceramic sleeves. 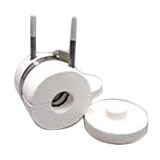 **Standard terminal length is about 1" protrusions from the ceramic face. Aluminized for UltraCoil Model. See illustration below for meaning of A, B, C, and D.
Cutaway of a Robust Radiator. Halves sold in pairs. Provided with Non-toxic Ceramic Enclosure GRR High Uniformity Robust Radiators may be used to approximately 1300°C. For temperatures higher than 1300°C for the Robust Radiator, please click on Robust Radiators. Please call for Dimensions of GRR. Dimensions are for heated chamber size. Please add about 1" - 2" thickness for ceramic shell. The following table provides dimensional guidance only for the heated zone. Use with DC or AC (50/60Hz). 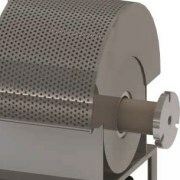 For custom sleeve heaters a minimum puirchase volume requirement may apply. Choice of solid lead as shown below or flex lead as shown above. Connectors available. T/C separate. Stainless steel shell separately priced. Model not listed above? Design Your GRR Robust Radiator Heater With our GRR Calculator. If not puchasing a MHI control system with the GRR unit/model or if choosing multiple units, please confirm the RR volts of the unit with the sales agent. ** Plug-in voltage indicates closest IBPAN preference. The GRR unit-temperature, ampearage (current) or power, cannot be exceeded in any configuration of use. 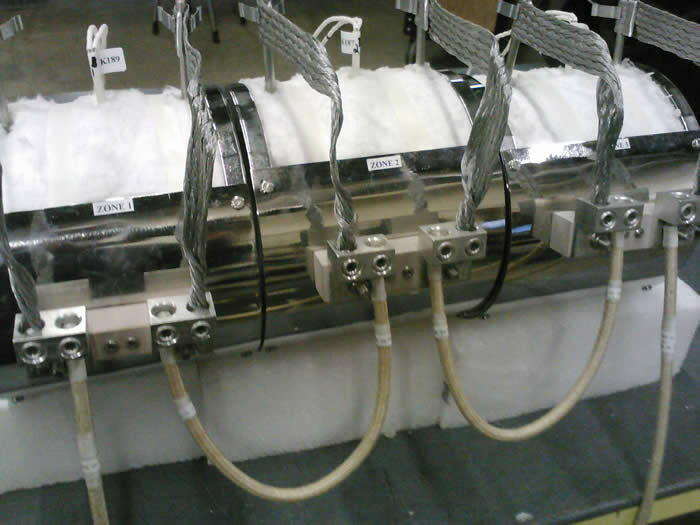 Configuration of use changes with end caps, load, flow placement of control thermocouple, and extent of insulation. Please check manual for maximum element temperature that cannot be exceeded. Unlimited Power witth Multiple Zones. Match to your line voltage if required Full line of electronic controls available. For more information please visit our GRR and Sleeve pages or send us a request for information. Robust Radiator™ Applications. To estimate approximate power requirement. Click here. How much energy and what kind of power will be suitable for your heating application? The estimators in the link above may be used to calculate the energy required for common processes. Then by choosing a time over which the energy will be used one can calculate the best power required from the heater. "...the heating system that you helped me set up is working great!" "...Robust Radiator is working perfect as a Crucible heater." "We just received the elements... they look great." "I am very pleased with its performance. We feel it can be useful for a lot of our projects." 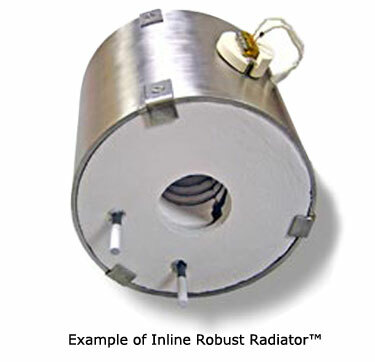 Unlike fully finished furnaces, Robust Radiators™ are products that are typically components of a larger system. Please be fully conversant with the electrical and safety requirements during installation and use, including the use of connectors. Please call MHI at 513-772-0404 when in doubt. Contact MHI for custom solutions.